The researchers at Nuxe have formulated a unique natural anti-aging, anti-wrinkle line of floral cosmetic crème specially developed for “first expression” facial lines. Fine lines can begin to appear along the cheeks, the sides of the eyes or by the sides of the mouth as early as 25 years of age. These 1st wrinkles are formed through repeated facial expressions initially leaving fine line marks called “first expression” facial lines. Closely linked to tension and these fine lines often respond to relaxation treatments. If you’ve ever experienced the relaxing benefit of a facial you’ve seen how de-stressing facial skin brings out a radiant, healthy, youthful looking complexion. 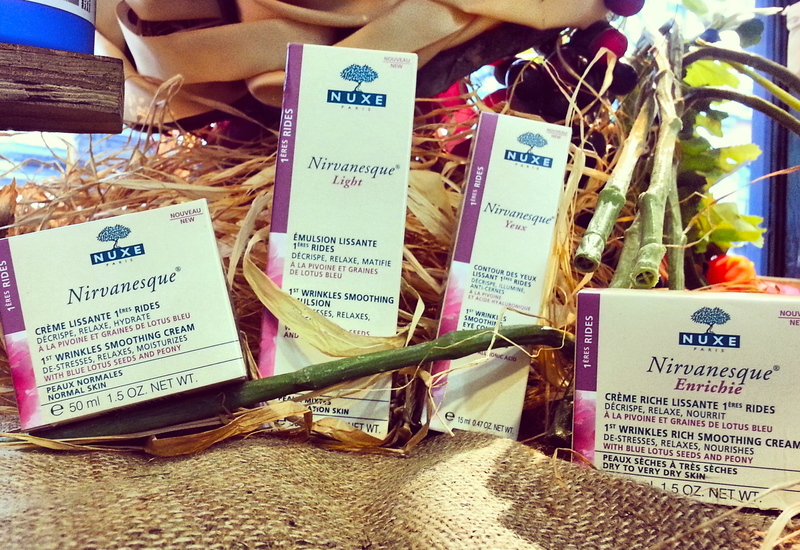 Recently Nuxe natural skincare launched its newly formulated NIrvanesque product line at Thompson Alchemists in Soho NYC. Many of you lucky enough to experience our Nuxe EVENT this past September 2013 received advice, recommendations and a free mini-facial from Esther Benzaken, Nuxe’s top skincare esthetician . The new Nirvanesque anti-aging line, recommended to ages 25 – 30 years old, contains four different creams allowing you to choose the formula that best suits your specific skin type. Creme Nirvanesque® (Normal Skin) First Expression Care / Age 25-30 – contains relaxing natural botanicals roots of Peony and ALTHEA along with Poppy and Blue Lotus Seeds mixed into hydrating Musk Rose Oil allowing for rapid absorption. The relaxing and hydrating properties smooth fine facial lines and wrinkles allowing facial features to de-stress providing a complexion that posses a healthy, glowing complexion. Creme Nirvanesque Enrichie® (Dry Skin) First Expression Care / Age 25-30 – is formulated specially for dry skin, this formula contains Macadamia Oil in addition to the naturally relaxing mixture of Peony and ALTHEA roots, Poppy and Blue Lotus seeds. Thick oils such as Macadamia Oil provide a coating on top of dry skin which allows for increased absorption of the relaxing floral combination. Creme Nirvanesque Light® (Combination Skin) First Expression Care / Age 25-30 – contains Peony and ALTHEA roots along with Poppy and Lotus seeds to leave skin visibly relaxed. The combination skin formula also contains rice powder to mattify oily skin. Eye Contour Nirvanesque® (All Skin type) First Expression care / Age 25 – 30 – contains the same relaxing botanicals as other Nirvanesque products, Peony and ALTHEA, Poppy and Blue Lotus seeds, so that fine lines and 1st wrinkles can be smoothed away. Nirvanesque Yeux also helps reduce the look of dark circles and brighten the eyes with botanical caffeine and corrective pigments. Apply twice daily to diminish the appearance of 1st wrinkles around the eye area leading to a more youthful look day after day. Nirvanesque moisturizing crème from Nuxe – Paris can be used day or night. Nirvanesque crème contains ingredients of natural origin that are free of parabens and is non-comedogenic.